There are few books that are life changers. This one was an almost-life changer. 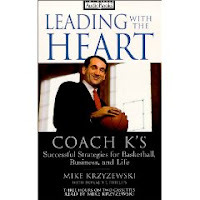 If I had found this book a year ago when I had a chance to use more of Coach K's principles in every day life, it would have been a life changer. It is just that good. Coach Mike Krzyzewski (pronounced She-shef-ski) has made a success of the Duke basketball program by a unique blend of systematic, military-style discipline and creative, instinctual gut reactions. In this book he lays it all on the table in what was a very absorbable form for me; he uses specific references to basketball. I enjoyed not only the principles he taught, but also feel that a piece of me has become a Duke basketball fan. I plan on re-reading this one again in the future. Another feature I really liked was the end-of-chapter summations of the key points. If you read the book once, and then review those bulleted lists at the end of each chapter a couple of weeks later, I am thinking that that is as good as reading it twice. I applaud Coach K, and his co-author, for putting this piece together and filling it with the personal, honest information that he did. It really makes the book. I will admit, I read this book purely because of the movie that is coming out. I like to read the book before seeing the movie, as it is near impossible, in my opinion, to do it the other way around. So what did I find in this Newberry winner? For one, I sense that this story continues on levels that I didn't even perceive on the first read through. If I wanted to, I could read this book three more times in a row, and get more from it each time. The symbolism between the characters and events in this book and real life are everywhere. At deeper levels, it is more about good vs. evil, and the choice that we all have to choose between them. Read it one more time and you will get insights about those who would entice us to choose one way or the other, and how there are both good people that want us to choose evil and how there are bad people that would have us choose good. Irresistible, isn't it? Well, I'm not going to do that. I chose to read it because it was a good story, suitable for children. And it delivered on that level as well. There is a little mouse who falls in love and has to stand up to mean rats to save her. That is just a plain good story. My only criticism: The writing style spoke directly to the reader at times, and I am not fond of that practice. It is similar in style to the Series of Unfortunate Events series, although very dissimilar in feeling. It wasn't horrible, but I don't think that it helped the story get the job done. So I said a while ago that the next story I read to my boys for a bedtime story was going to be a more recent, more boyish story. Well, I said that but I already had Ralph S. Mouse in my library basket at home, so I somewhat postponed that statement. I say somewhat because by all accounts this classic by Beverly Cleary is more boyish. Still a little dated, but much more boyish. The boys would agree with that as well. They all got into the story, and stuck with it pretty well. My criticism? I don't have much to say really. It wasn't fantastic, and there are a few "silly" aspects to the characterization of the main mouse, Ralph, but overall it is age appropriate for my crowd (ages 5-9). I feel that since I don't have any big issues I have to rate it higher, although I will also admit that it isn't in my target age category.